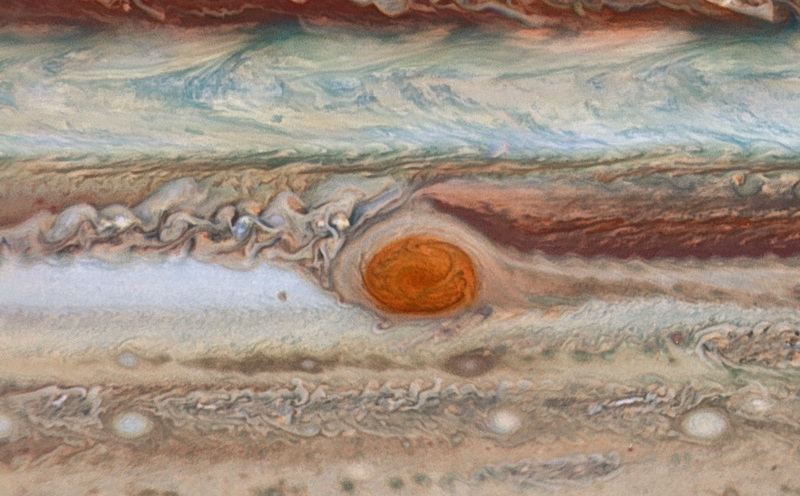 New Hubble Images Show Jupiter's Great Red Spot Is Still Shrinking : The Two-Way But, using images from the Hubble Space Telescope, scientists have learned the great storm is putting up a fight because it is now shrinking at a slower rate. This new image from the largest planet in the Solar System, Jupiter, was made during the Outer Planet Atmospheres Legacy (OPAL) program. But, scientists say, the big storm, which has been swirling around the planet for hundreds of years, will likely put up a fight before it dissipates. Using the NASA/ESA Hubble Space Telescope scientists have produced new maps of Jupiter. In overlaying both created maps on a globe, the movement of the dust lanes becomes visible. This allows scientists to calculate the wind speed in Jupiter's atmosphere. "[The storm] has been decreasing in size at a noticeably faster rate from year to year for some time. But now, the rate of shrinkage seems to be slowing again, even though the spot is still about 240 kilometers smaller than it was in 2014. "The spot's size is not the only change that has been captured by Hubble. At the centre of the spot, which is less intense in color than it once was, an unusual wispy filament can be seen spanning almost the entire width of the vortex. This filamentary streamer rotates and twists throughout the ten-hour span of the Great Red Spot image sequence, distorted by winds that are blowing at 540 kilometers per hour." Michael H. Wong, a researcher at the University of California Berkeley who co-wrote the paper analyzing some of these images, says the wispy filament remains a mystery. It's a cloud feature, Wong said, but it's a bit strange because it's almost a straight line when you would expect a feature inside an oval to be distorted. So, what it's doing there and whether it will be there in the next set of photographs is a big question. Scientists also noticed another feature: A rare wave structure near the equator that had not been spotted on the planet since Voyager 2 took a picture of it in the '70s. As The Guardian reports, Hubble takes images on a yearly basis, giving scientists the "material they need to observe changes in the appearance of planets year after year."